It has been a while since I posted a “bonehead of the week” award. This award goes to…. me. 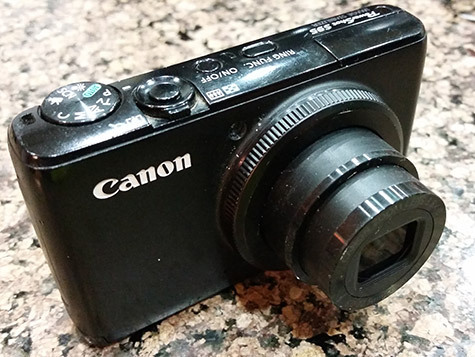 One of my key tools here at HOG, my pocket sized Canon S95 camera, has died a strange death. The cause of death was technically drowning, after it spontaneously attempted (and succeeded) a swan dive into the toilet. No, I was not trying to shoot a selfie or taking pictures of my private parts (need different camera for that with special macro lens). The camera was in the pocket of a hoodie I was wearing, and as I was getting ready to use the facilities the camera unexpectedly launched itself out of the pocket. There’s a bit of a delay when you see a $500 electronic item sitting at the bottom of the commode, where you normally see other “objects” which are not to be touched. Not sure if that slight pause was kiss of death or not, but it is definitely odd to have to reach into the pot and dig something out. First time I’ve done that, and hopefully the last. I’ve used this great camera for many on course photos, videos, and many product photos. It has been a great tool in my arsenal since clear back in 2011. I’ve captured thousands of photos with it. It had a good run. Unfortunately I’m not really positioned to replace it at the moment. On a blog budget, one doesn’t have an extra $500+ sitting there waiting to be spent on equipment. And, more honestly, I’ve spent all my money on remote control multi-rotor helicopter parts for my aerial photo and video ventures. $500+ you ask? I don’t go with cheapo point and shoot cameras. Though this is pocket sized, it is a much higher quality unit with a much wider lens than an average camera of this size. I’ve inquired with Canon about repairs, but I’ve already repaired this one once after taking photos in a sandstorm. We’ll see what they say, hopefully soon.